Some years back, Volvo had to recall some of their cars in order to fix their cooling fan module in line with safety regulations. This was after many of their buyers experienced the same problems that were then associated with a fault in the cooling fan module. A cooling fan module helps to maintain a constant supply of fresh air into the cabin of a car by controlling the blower that supplies the air. When cool air is produced in the car’s A/C system, the cooling fan module blows it into the car maintaining a fresh supply of air even when the windows are all rolled up. Additionally, the cooling fan module also controls the A/C fans that are located near the car’s radiator, under the hood, effectively regulating the temperature in the other car parts as well. Like most other components in the car, the cooling fan module can also become faulty over time. This can be a result of a number of problems that range from defects in the cooling system module itself to wiring problems within the electric circuit of the car. The most obvious symptom of a faulty cooling fan system is the increase in warm or hot air in your cabin. A broken cooling fan system will affect the motors that run the blower causing them to supply less fresh air into the cabin of the car. You will notice that the car will constantly be hot and stuffy as a result. If you find that your Volvo’s A/C system does not come on even when the parts under your hood become too hot, the cooling fan module may not be working at all, meaning it’s definitely time to find a replacement. The cooling fan module is supposed to cool the car parts when they get too hot. They do this until the temperature comes down to normal levels. If your cooling fans do not stop even after the temperature has been regulated or even when the car has been switched off then it is probably faulty and needs repair. Failure of the cooling fan module to regulate the temperature inside the hood of your car can lead to the engine overheating. This can also happen when the cooling fan module is weak and therefore the fans work at a slower pace and are not able to regulate the heat. 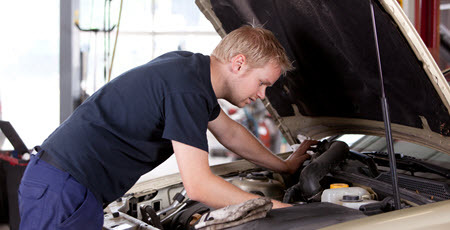 The faulty cooling fan module in your Volvo can simply be fixed by replacement. You may need to have a professional mechanic look into your car and give you the correct diagnosis as to why the fan module is not working as it should since the problem could stem from a number of reasons. This will help you avoid misdiagnosis that may end up costing you a lot more money than you would have spent in the process of replacing the cooling fan module. To replace the cooling fan module in your Volvo, you will first need to locate it under the hood of the car. Most user manuals will have a clear image of where exactly this should be. You must switch off the ignition of the car and be careful while going about this to prevent injuries. You should also be careful because a faulty cooling fan module may cause the fans to continue running even after the car is powered off. You will have to carefully remove the fastener bolts that hold the module in place before replacing the old one with an exact match in its place and putting back everything as it was initially. Test the new unit by switching on the car to see how it works and if it needs more work. Alternatively, you can have a professional mechanic do this for you. TechPlus Automotive has dedicated technicians on call that will replace the cooling fan module in your car as fast as possible. Call us to make an appointment right away and we’ll get your car cooling again! * Volvo XC60 R-Design image credit goes to: gargantiopa.